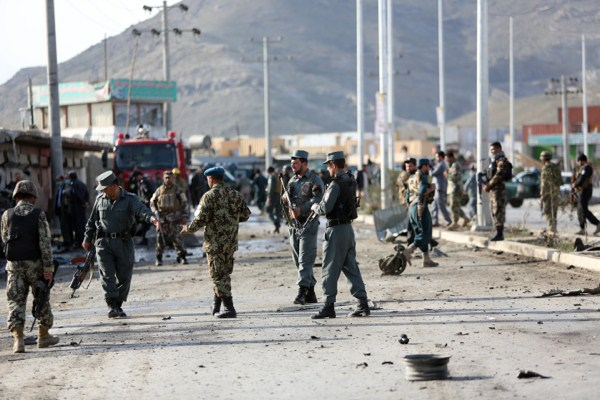 Afghan security personnel gather at the site of a suicide attack, Kabul, Afghanistan, April 10, 2015 (AP photo by Rahmat Gul). Most days in March, pairs of young men mounted Honda 125 motorbikes to ride out of a mud-walled compound in the town of Muslimbagh, in Pakistan’s province of Baluchistan. Turbans wrapped around their faces to ward off the dust, they headed for the Afghan border, 50 miles away. These young men, recruits from the marginalized Pashtun communities of the borderlands, were riding off to be fighters for the Taliban. Most of their peers who have not taken up arms toil as casual laborers for the meagerest of pay. By joining a dilgai, or Taliban armed group, the young Pashtun men are entitled to a set of clothes and a pair of training shoes, a share of a motorcycle and a modicum of respect. In twos and threes, these motorcycles have been setting off from Muslimbagh and other muster points along the Afghan-Pakistani border in recent weeks, in the Taliban’s latest spring military mobilization, as melting snow opens another fighting season in the mountains.